This one is a blast from our past. I used to make this soup a lot, but I lost the book in a house move a few years back. I remembered that it was a book I’d bought in a supermarket a long, long time ago, it took me ages to track it down on the internet, but I found it, here on RecipeSource. Cauliflower and Coconut Soup originates from a book by Jane Suthering, called ‘Sainsbury’s Vegetarian Suppers’ and this recipe is on page 72 apparently – no longer having my copy I can’t verify this. Cooked cauliflower can be soft and tasteless, but this retains texture and with the spices and apple it makes a versatile and filling winter soup with plenty of flavour. However I can say that its good, really good. There’s a number of ingredients for this but it’s fairly quick and easy to put together. This should serve 4 people. Heat the oil in a large heavy based pan, then add the onion and carrot, frying for about 5 minutes. Then add your cauliflower, the apple and the spices. Mix it up well and cook for a further 2 minutes. Next add your stock and bring the pan to the boil. Put a lid on and simmer the soup for 20 minutes. If you are using an AGA, you can safely pop this in the roasting oven to cook – ensuring you’ve used an ovenproof pan of course. After 20 minutes; return the pan to the hob if you are using an AGA, remove the lid and add the remaining ingredients. Keep stirring and continue to simmer until the beans are heated through and all the coconut has melted. This apparently freezes well though I don’t think I’ve ever done this, as it generally gets eaten in our house with none left to freeze. 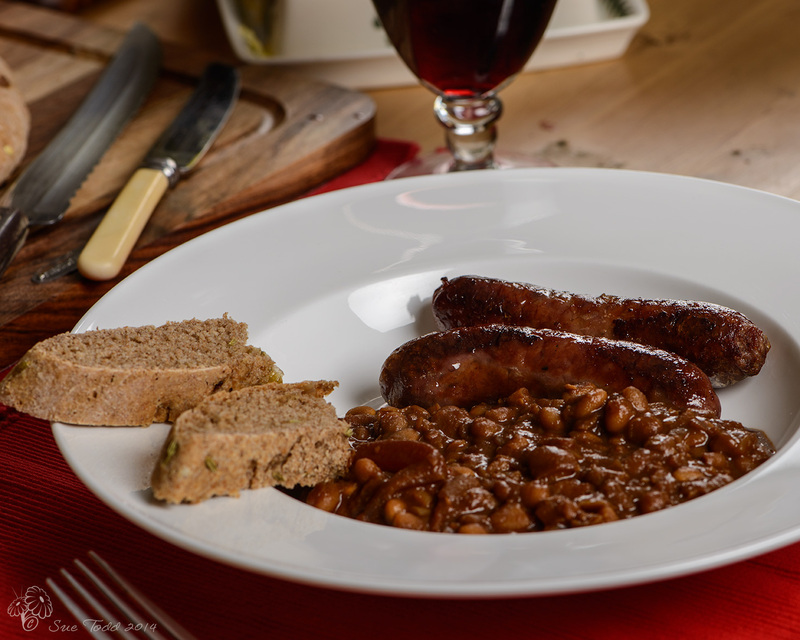 You can use any cooked or tinned beans you have to hand instead of the borlotti beans. 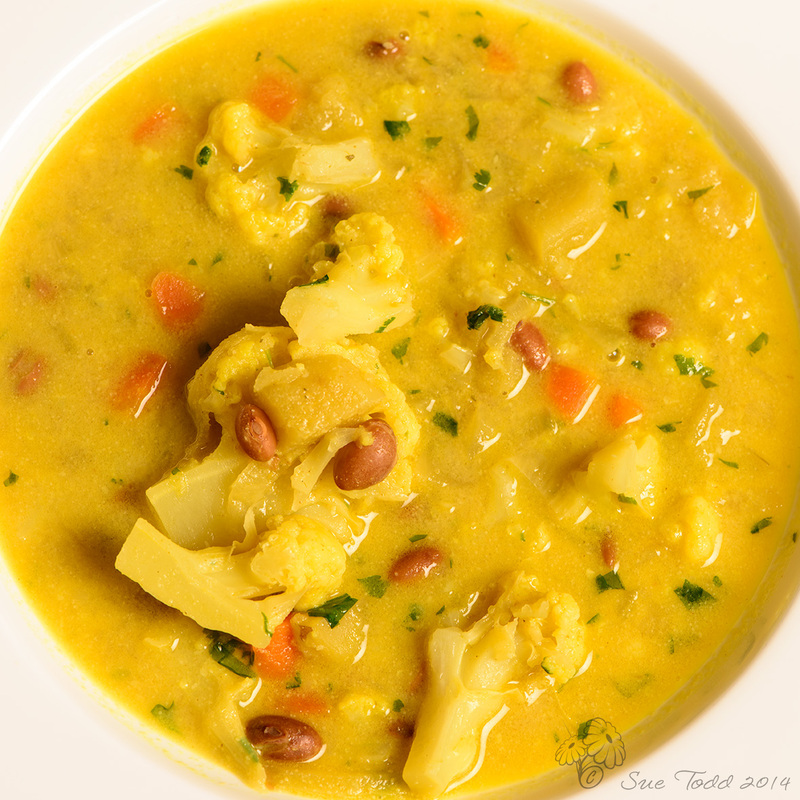 This entry was posted in Recipes, Soup and tagged Beans, Cauliflower, Coconut, Soup on December 8, 2014 by Sue Todd. The arrival of Autumn signifies the need for rich casseroles and warming comfort food. 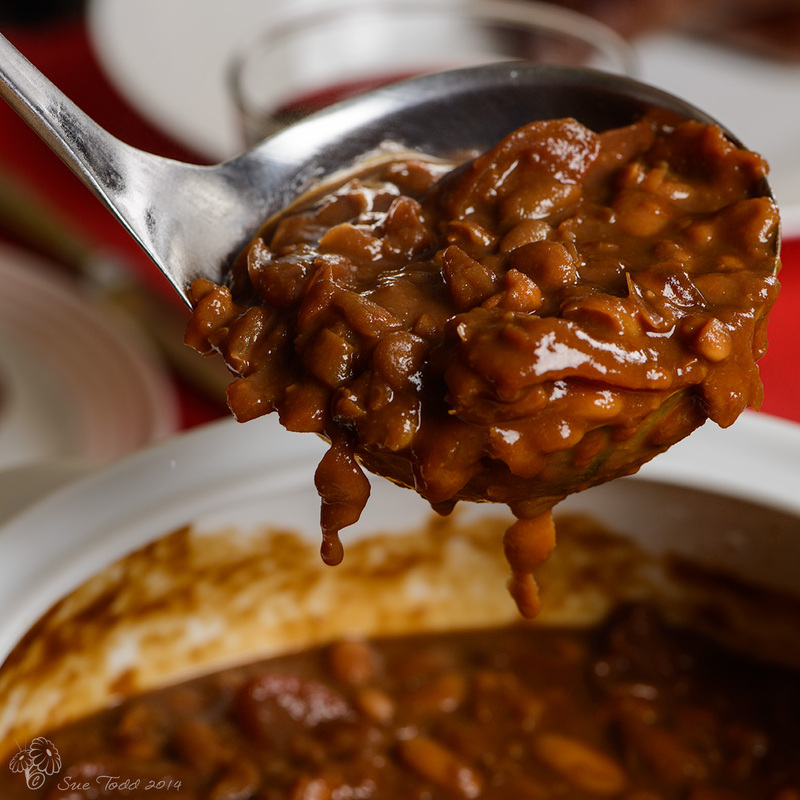 Generally the first of these in our house is Boston Baked Beans, and given the weather today, it feels like time for this dish. We started to make this about 27 years ago now, heavens that makes me feel very old. Back then I had a toddler with various food allergies and an aversion to meat. In an attempt to get food into him we moved to a vegetarian diet and stayed with it for some years until we moved out to the countryside and raised our own meat. It was at the start of our veggie years that a dear friend bought me a copy of Rose Elliot’s Bean Book, which now has many loose pages, but is still very much treasured and still in use. 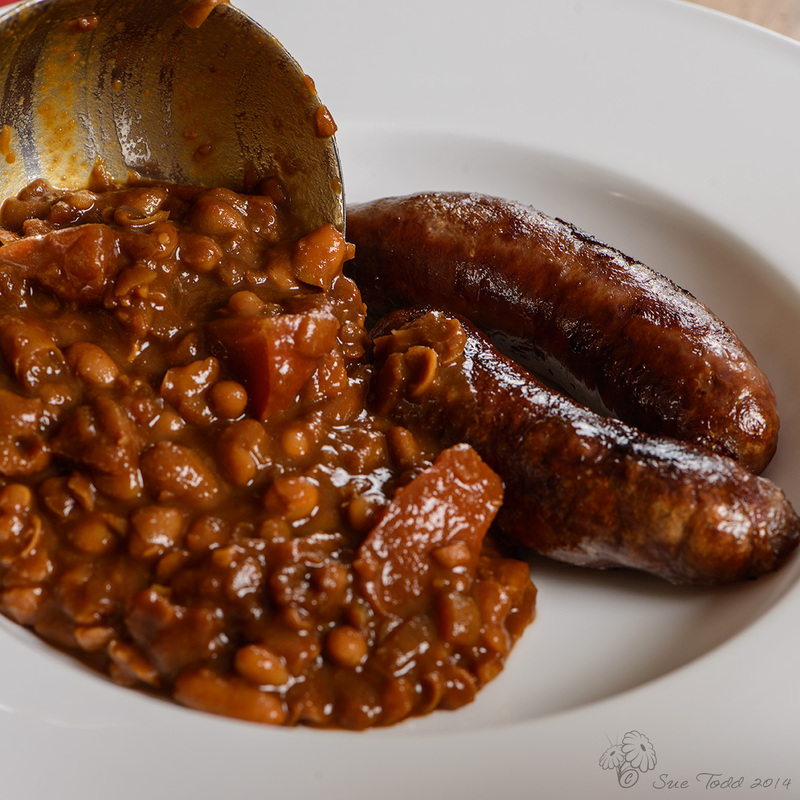 We started to make Rose Elliot’s Boston Baked Beans then and have adapted this recipe over the years to include sausage or bacon generally. The recipe below is totally veggie but do feel free to add meat. It isn’t hard to make and you can make it easier and far quicker using tinned haricot beans – this is about the closest we get to fast food. The difference between these beans and those ready done tinned varieties of baked beans is massive. These have real gutsy flavour, and all the ingredients are real food, no flavourings, no additives and no colours. The very kind people at Rountons Coffee, sent me some of their coffee to try, I’ll be talking more about that in a forthcoming post. Their coffee is delightful and I highly recommend you try it. Since it arrived, I have been searching for recipes involving coffee, wanting something a bit different to the ubiquitous coffee and walnut cake, which while good isn’t going to set my world on fire, If only because I don’t have a sweet tooth. I came across a recipe for “ultimate coffee baked beans on toast” and thought it was time to adapt our recipe once more, so what follows is our latest version of Boston Baked Beans. 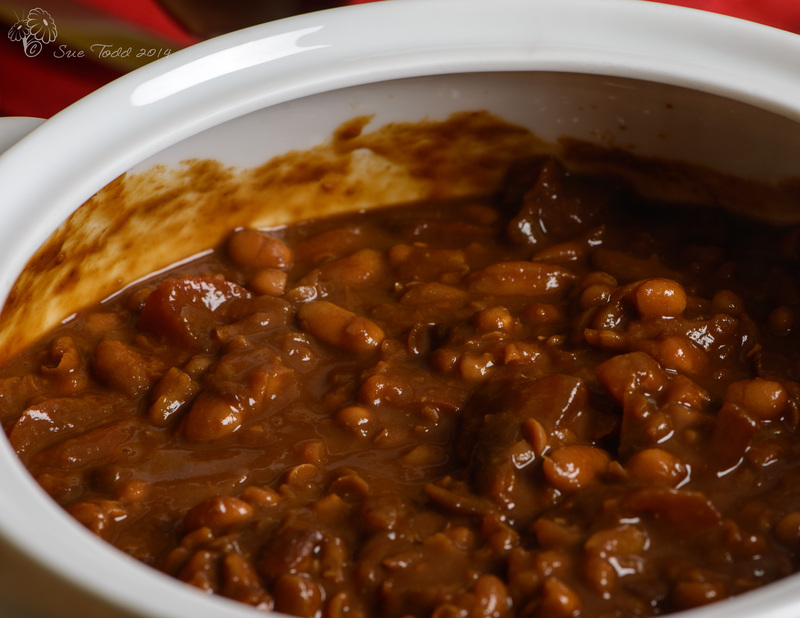 Served in a bowl with a big hunk of freshly baked bread, Boston baked beans is Autumn comfort food at its best. Any leftovers are great for breakfast next day too, especially in a pot with an oven baked egg on top! If you want to make this without the coffee, just substitute the same amount of liquid stock for coffee. You could use tinned beans, however, if you are using dried beans they need to be soaked first. Ideally you’d soak them overnight. But if you are as organised as we tend to be, that may not be an option. In which case this is the next best solution. Take the beans, rinse them, put them in a pan, cover them with water and bring them to the boil on a hot hob. Boil them hard for 2 to 3 minutes, then remove them from the heat, cover and leave to soak for about an hour. After the hour is up, rinse the beans again under the cold tap. This is meant to make them more digestible. Then put them back in a saucepan, cover with water or unsalted stock (avoid salted stock or adding salt at this point as both can toughen the beans and prevent them from cooking properly), and cook for between an hour and an hour and a half, until almost tender. A pressure cooker is another option for moving the beans on quickly, but I don’t use one and they terrify me so you’ll never get instructions from me on that one. Once cooked strain the beans and rinse once more and they are ready to turn into Boston Baked Beans. Peel and finely chop your onion. Heat the oil in a flameproof heavy based casserole before adding the onion. Fry the onion for about 5 minutes before adding the remaining ingredients. Bring the dish up to the boil. Put a lid on the casserole dish and pop it in the oven. I used the AGA baking oven. If you are using a conventional oven you are looking at around 275F/140C or Gas Mark 1. Cook for about 4 hours, stirring from time to time. Another option without an AGA is to use a slow cooker which is probably more efficient than a conventional oven. Either way coming home to find dinner ready and waiting on a cold day is wonderful. Add some bacon after the onion and incorporate into the whole dish. Serve with fresh bread and sausages, and a large glass of red wine. Totally delicious. This also travels well in a food flask for winter outings or taking to the office/school. This entry was posted in Meals, Recipes and tagged Beans, Boston Baked Beans, Coffee on October 4, 2014 by Sue Todd.